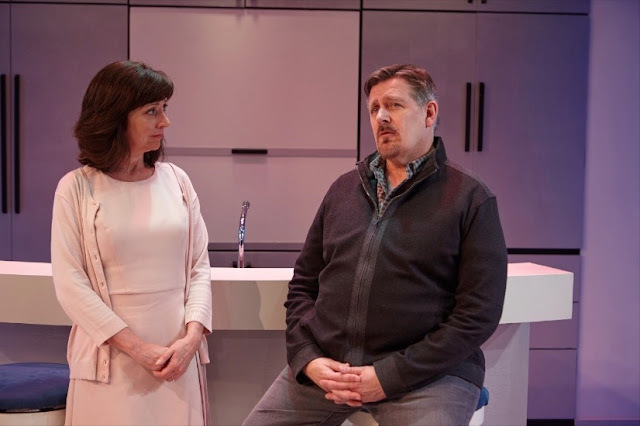 Carol's Theatre Reviews ~ It's Fun To Go Out: Are ‘PRIMES’ our new reality? 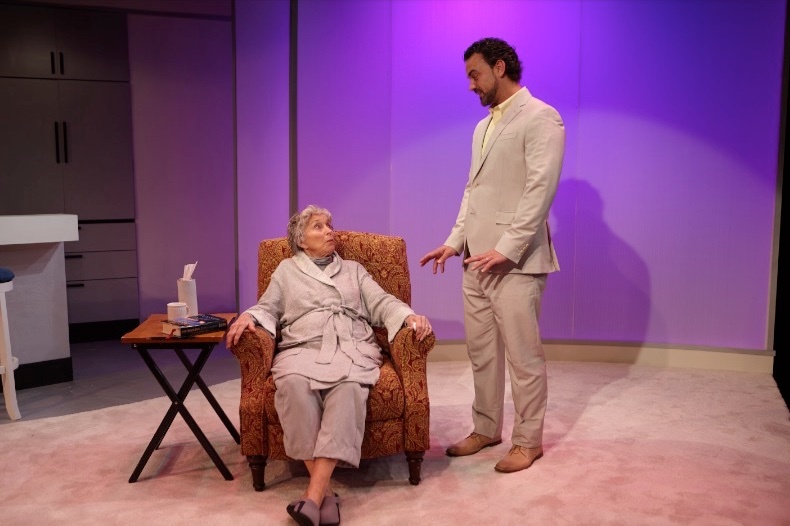 Jordan Harrison’s 2015 Pulitzer Prize finalist for drama and his 2016 Horton Foot prize “Marjorie Prime” is making its San Diego premiere at North Coast Repertory Theatre through Feb. 5th. It’s a bold new idea that might strike a few nerves within the audience. No one likes to talk about memory or loss or for that matter dementia within the family. Some of the memory loss we all might be experiencing like the name of someone we really knew in our favorite movie but can’t seem to pull up right now seems perfectly reasonable to me. Nothing defines us more than the memories we carry within us. In my family, my brother and I have different memories of the same occasions that happened in our family growing up. That too seems reasonable. But what happens when we don’t have that memory to rely on or anyone to fill in the blanks? When that all goes away, what do we have left? That’s one of the pressing themes in Harrison’s play among other things. How it affects those around us and dealing with it is also of great concern. 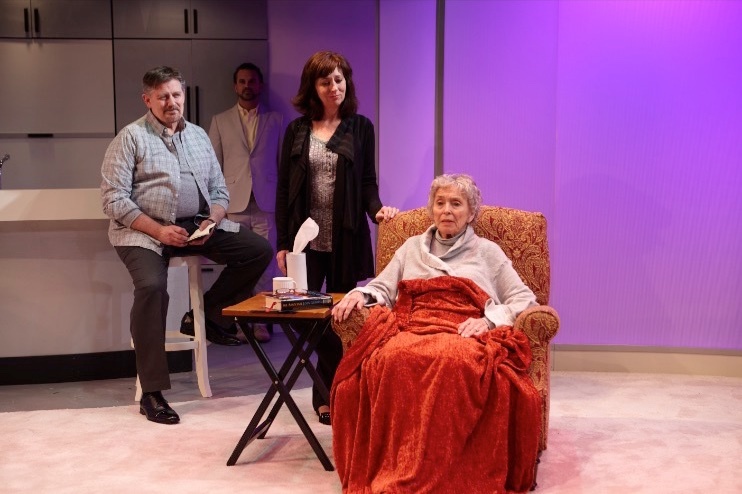 For Tess (Elaine Rivkin) and Jon (Gregory North) Marjorie’s (Dee Maaske) daughter and son in law the impact of Marjorie’s memory loss is monumental, as you will see watching the play unravel or rewind in some instances. It is a bit confusing at the outset (and for yours truly continued somewhat throughout) and what’s not revealed at plays end, will be the topic of conversation for many on the way home, as it was for me. The setup is such that it takes us further into the future introducing us to Walter (Steve Froehlich) a perfectly coifed handsomely dressed young man looking right out of an 80’s playbook. He is as they might say in the industry, ‘an artificial intelligence composite’, or robot, made up of pixels programed to simulate Marjorie’s late husband when he was younger, maybe in his thirties. He is Marjorie’s PRIME. Walter is parroting information about Marjorie’s past that Marjorie’s son-in-law Jon has fed him. Jon as a diary of sorts with all kinds of facts (he’s been married to Tess for over thirty years) and when the information needs updating, Walter gets it. Walter tells Marjorie stories to make her feel better. In other words, Walter is Marjorie’s memory. The professionals agree that this is the exact therapy Marjorie needs to keep her mind active and another source of company beside her hostility ridden daughter. Marjorie will occasionally ask questions of Walter and the answers are spoon fed to her. “I could tell you a story. You liked that the last time.” “I’ll have to take your word for it.” In their reality, Walter can tell her as many versions of the story that she would like to hear. Most of the time spent with Marjorie is all well and good. But there is trouble in Prime-ville between Tess and Jon that all is not as it appears. It seems that other ‘Primes’ come in and out of the picture and more morbid facts and family secrets come out at some of the most unexpected times. Information about Tess’ brother Damian, for example reveal the good the bad and the indifferent about the family dynamics and why Tess is so depressed and argumentative. No one talks about the down side of Damian’s life, rather in glowing terms. When we do learn of his suicide it hits us between the eyes as the truth about his short life is finally let out of the bag. More family secrets leak out over the course of the play. Piecing the story together kept me wondering if it was just me, or the fact that dealing in the abstract is not one of my stronger assets. 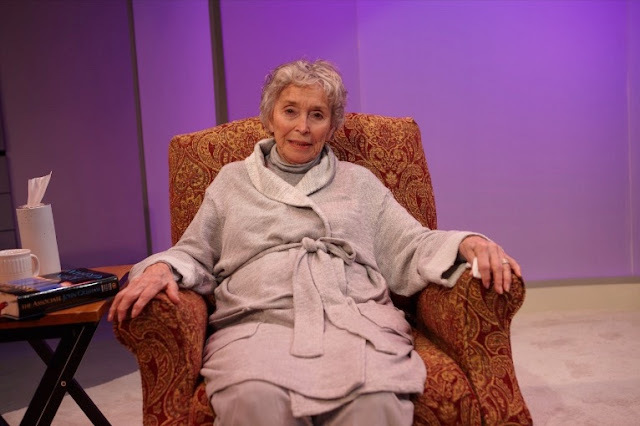 Slowly approaching an age closer rather than further away from Marjorie’s and noticing that oft times I have to run through the alphabet to remember a name or place caused me to have a few concerns of my own while sitting through Harrison’s play. Director Matthew Wiener keeps us on our toes throughout, with a well -balanced cast making a case either for or against the need for a prime. Dee Maaske is charming and convincing as Marjorie. She grows in the role and one can definitely empathesize with everything about her that she has lost and will never get back. Steve Froehlich is well programmed as Walter, her substitute husband. He is used as a tool to keep her interested and possibly prolong her life. While not doing too much when things do not revolve around Marjorie, he is always engaged. Elaine Rivkin and Gregory North make a believable couple with North’s Jon a bit more compassionate toward his mother-in-law than her daughter. Tess has more at stake here than Jon, having grown up with Marjorie and all the family secrets that kept the family in a state of repression and depression for years. She plays into her grief well. Marty Burnett’s set in Tess and Jon’s living -room is pretty much bare bones necessities with open kitchen, overall all generic looking with an easy chair off center for Marjorie’s comfort and a couch backing up against the kitchen counter and hallways of to the side. It is enhanced by Matt Novotny’s colorful lighting design with changing seasons, beginning with all things bright and alive and colorful and ending with the dark empty layers of winter. Elisa Benzoni’s designed the costumes and Melanie Chin the soundscape. Harrison’s “Maple and Vine” that made its Southern California premiere in 2014 is a look back at the past (1955) to a time when things were simple and ‘authentic’. Now he’s bringing the future to us in ways that might just become the norm in years to come. You be the judge. 1955 was a good year for me. Just sayin’. Harrison’s play has also been adapted for the screen. It will be premiering at the Sundance Festival next year.